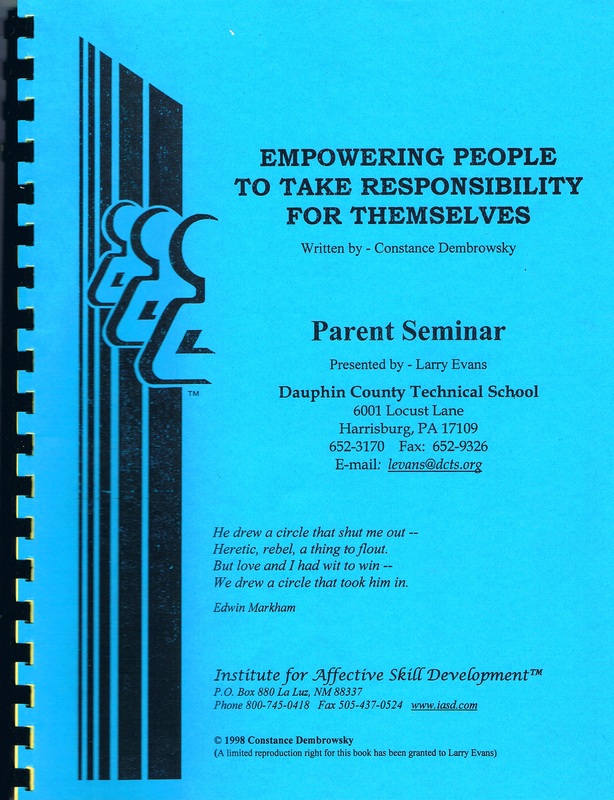 2) I could not improve on the two already written that turned my life around, and literally ‘saved’ my life… the Bible and the Personal and Social Responsibility curriculum I taught the last 2 dozen of my 41 year teaching career. My gift is teaching from these two “books”… thus, my first “book” below. And I found that more I studied God’s word the more effective my teaching her curriculum became. Transcribing has helped me become not only a more peaceful person, but a better teacher. And one doesn’t even have to agree with this pastor, but listening and reading his words will improve your communication skills well-crafted words and authentic, easy-to-understand delivery style are refreshing. And while each pastor has their own style, this guy could be a “tuning fork” for all. In addition to the author the following is also dedicated to my 7000+ former students and their parents who contributed to our mutual growth over the years. Thank you… our lives will never be the same because of the time we shared. Re-sharing, “Paying it Forward” will increase the ‘natural highs’ we got during our precious time together. There’s still much to be added, especially instructive material threading the ANGER and MOTIVATION sections at the end, as well as breaking this massive amount of information into more chewable chunks. What follows can be used as a stand alone learning tool, or along with a partner: like a parent and child, sitting side-by-side with their own Smartphone or laptop monitor. The parent could read the material and the “student” could listen and zoom in on specific charts as directed. The potential is limitless. Note: A humorous but enlightening vision just came to me: I see a parent and their possibly defiant “hormonally turbulent teen” together in the same room, able to hear each other, with teen slouching on couch, smart phone in hand, while parent assumes a less threatening position in their “easy chair”. Below, are select pages from the Activity Books used by my students and the yearly Parent Seminars that accompanied the student class. I LOVE CONSTRUCTIVE CRITICISM !!! Join me in this journey even if you’ve never taken the course… simply dive in and swim through some of the most life changing material you will ever read. Updates and improvements will be made continuously so come back often and go through it again. Like many “truths”, we can never get too much, and “repetition is the mother of knowledge”. PS. 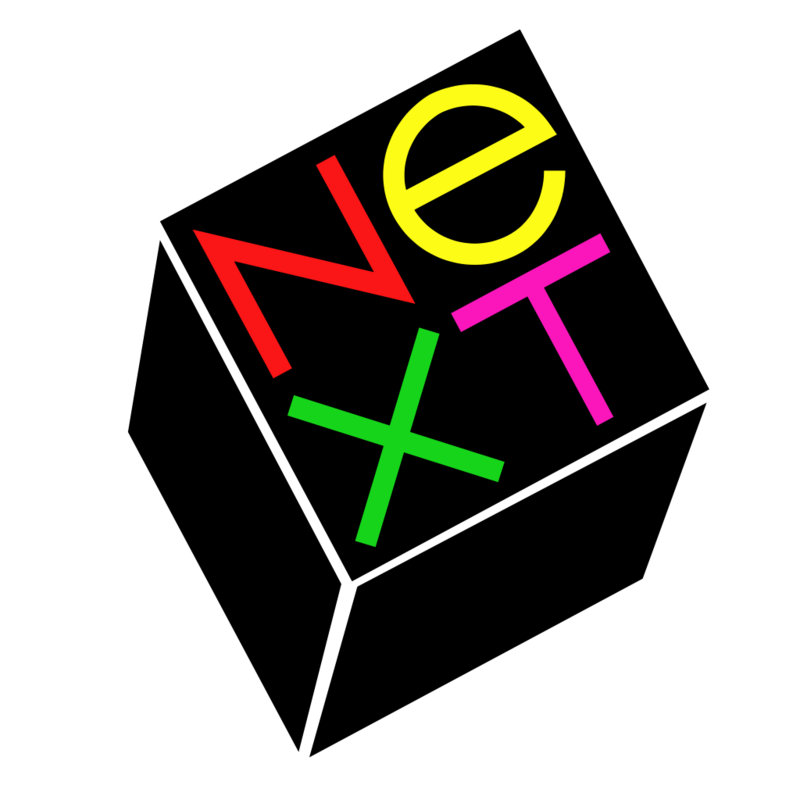 An even more user-friendly .pdf format is forthcoming (when I learn how). Personally, I’m still learning how to better apply these lessons to my own life—even after presenting them over a thousand times. If you’ve a teenager, a child, or any-one… and you’d like to learn together… this would be a great growing and bonding opportunity for all. 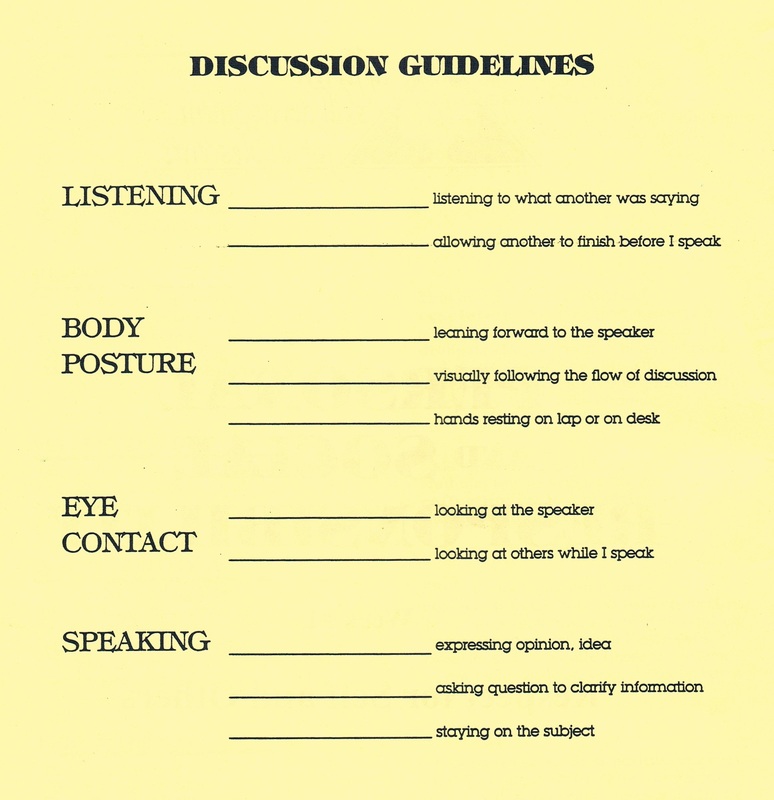 Learning together becomes more efficient as we improve our DISCUSSION SKILLS, which is why we begin here. There are four components listed below — each equally important. In class I’d periodically stop in the midst of a lesson, have students turn to this page and put a check-mark on the line self-evaluating where they thought they were at that moment. This was better than me pointing out their weak areas because they were empowered to see where they needed work; they could then choose to make the change themselves; rather than being “told” to by me the teacher. EYE CONTACT and BODY POSTURE say much more than our words alone. Productive discussions depend on the exchange of ideas. To understand all the points being made, it is essential that you listen to what each person has to say. An important part of listening is allowing the other person to finish before you begin speaking. The specific items in this area are listening to what another is saying, and allowing another to finish before you start speaking. When you participate in a discussion, an attentive body posture keeps the discussion going because it physically indicates your interest and involvement. Attentive body posture means leaning forward toward the speaker, following the flow of conversation with your eyes, and not doing distracting behaviors like playing with your pencil or tapping your foot. Specific items in this area are leaning forward to the speaker, visually following the flow of discussion, and resting hands on desk or lap. To understand what another is saying, it’s helpful to look them in the eyes. It helps you, the listener, pay more careful attention. It also helps speakers by letting them know you’re interested. When you’re the speaker, it’s just as important for you to maintain eye contact with those who are listening because it helps them pay attention to what you are saying. The specific items in this area are having eye contact with the speaker, and having eye contact with the other person while you speak. This course is to help you understand clearly what you want out of life, and how to get what it is you want. When you can do that you have PERSONAL POWER… which as we’ll learn is a term interchangeable with the RESPONSIBILITY. Below list “truths” a person of power accepts. Principles have been proven true having withstood the test of time. Read them; think about them; digest and then read again another time until you both understand and accept each point. This entire course helps you understand what personal power is and how you can get it. If that’s what you want, you’ve come to the right place. 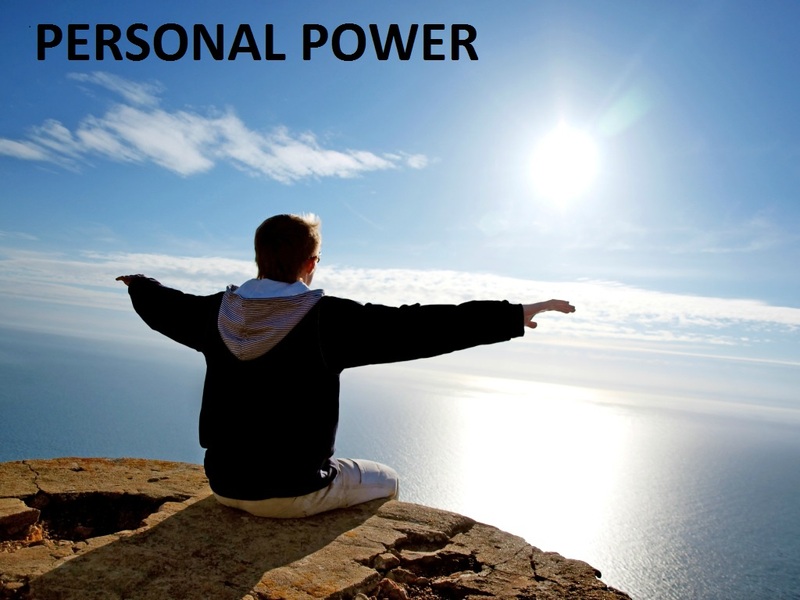 The concept of personal power rests on five principles or concepts. 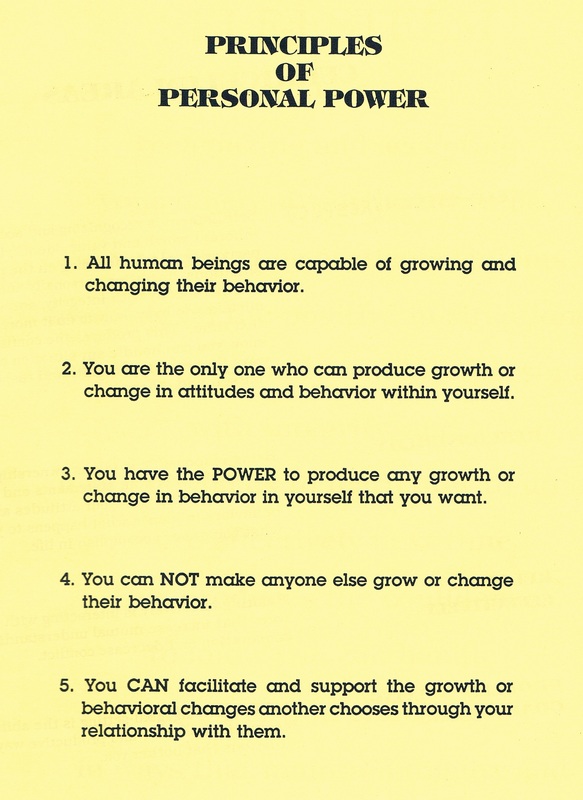 ALL HUMAN BEINGS ARE CAPABLE OF GROWING OR CHANGING THEIR BEHAVIOR. You know you can learn new skills – you can learn to ride a unicycle, juggle, do algebra, fly an airplane, or whatever. You can also learn new behaviors to replace ones that aren’t effective in getting you what you want. You can motivate yourself to do things rather than laze wound, or you can be outgoing rather than shy, you can not get angry when things go wrong. 2. 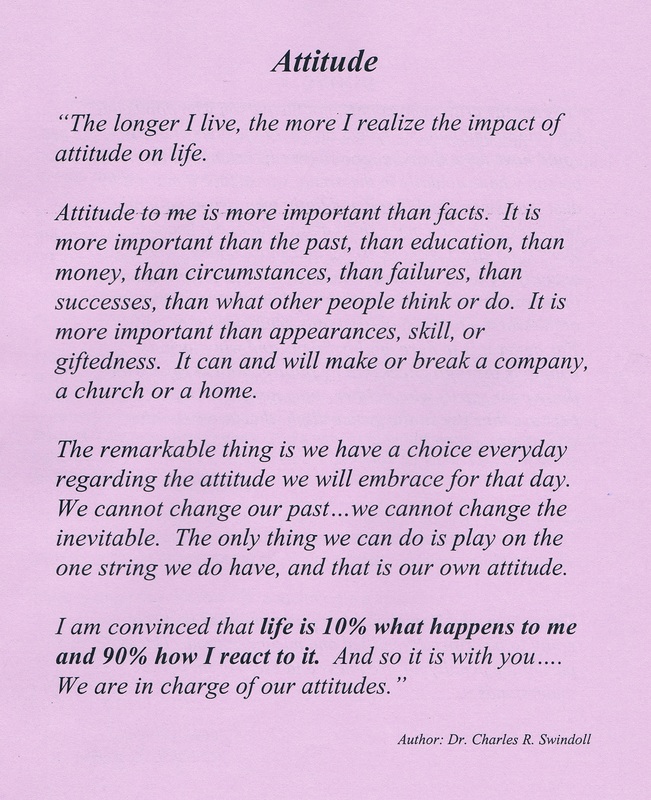 YOU ARE THE ONLY ONE WHO CAN PRODUCE GROWTH OR CHANGE IN ATTITUDES AND BEHAVIOR WITHIN YOURSELF. No one else can make you change or grow. No one else can do it for you. You are responsible for any and all change or growth that occurs in you. 3. YOU HAVE THE POWER TO PRODUCE ANY GROWTH OR CHANGE IN BEHAVIOR IN YOURSELF THAT YOU WANT. Nothing can stop you from achieving something if you are 100% committed to it. You are capable of achieving whatever goal you set. 4. YOU CAN NOT MAKE ANYONE ELSE GROW OR CHANGE THEIR BEHAVIOR. You can not control anyone else’s growth, change, or behavior. Each person has control and power only over themselves. 5. YOU CAN FACILITATE AND SUPPORT THE GROWTH OR BEHAVIOR CHANGES ANOTHER CHOOSES THROUGH YOUR RELATIONSHIP WITH THEM. People learn best in the presence of someone they like who facilitates their growth. there would be only one best. The next unit introduces the hierarchy of human needs and how it influences behavior. It also will expand your understanding of self-esteem. It shows that self-esteem is not a fixed quantity, but a variable which you can increase and thus enrich your life. Or, “HOW TO GET A LIFE” by moving your way to the top of Maslow’s Hierarchy of Basic Needs. As you understand your own basic needs and how those needs influence your behavior, you will be able to use the affective skills presented in this course to meet your basic needs in constructive, healthy ways. 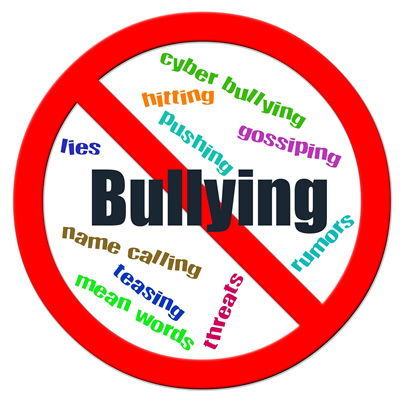 It is important to know that Bullies have low self-esteem… they’re low on their Basic Human Needs and are powerless. 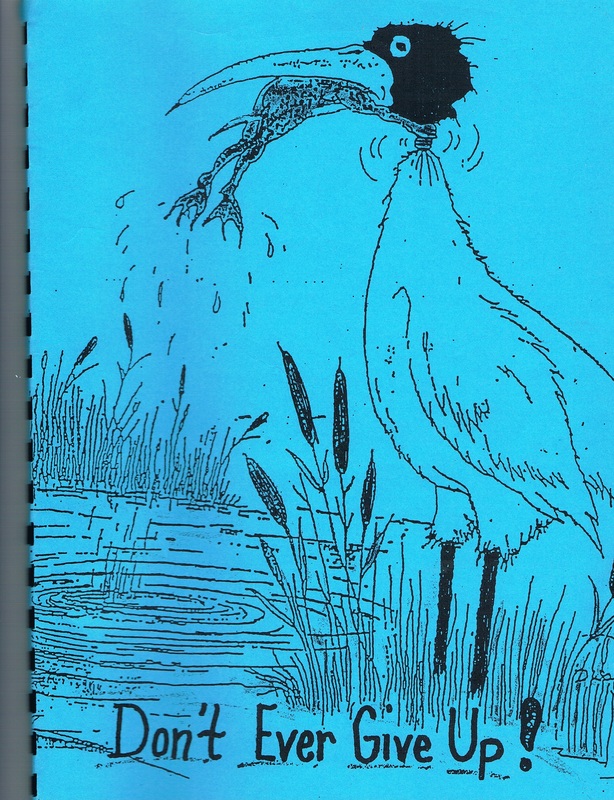 Bullies are like vultures… vultures can only eat dead meat. Bullies only pick on the weak. Therefore if we teach the “victim” how to get more of a life.. how to take control of their life they will not attract the bully and s/he will die off. A scientist named Maslow studied people and concluded that all human beings have five basic needs. He believed that whatever people do is an attempt to meet those needs. This chart is a hierarchy. That means you start at the bottom and move upward through each step to the top. Food – You need to take in enough food to stay alive. Liquids – You need to take in enough fluid to stay alive. This most basic level also includes needs that contribute to the quality of life you maintain, and so it includes these things. Sleep – You need enough sleep to let you function well. Security – You need some foundation or structure in your life. Predictability – You need some idea of what’s going to happen. Consistency – You feel secure when things stay the same. Too much change that happens too quickly is hard on you. For example, moving a lot disrupts your feeling of consistency. Comfort – To be comfortable, you need to know what’s expected of you so you can tell what to do and how to act. mat’s really what knowing the rules of the game is about. 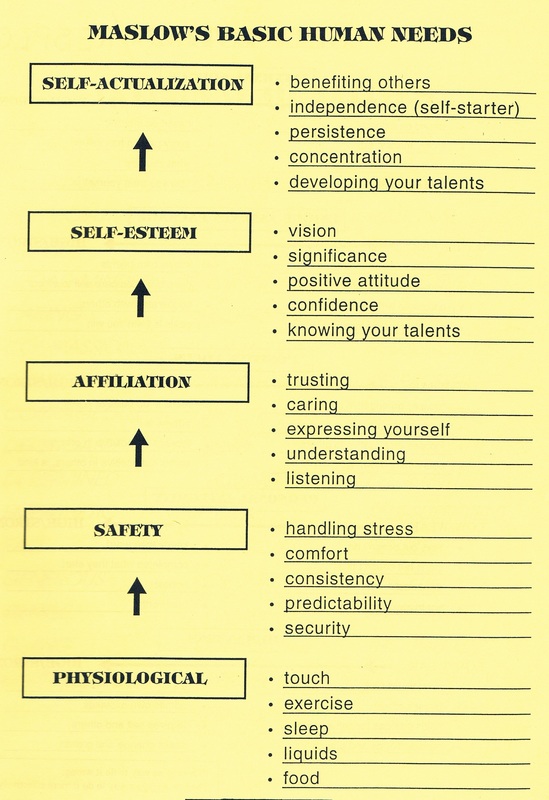 “The third level is AFFILIATION needs. Every human being needs meaningful connections with other human beings. Affiliation is built on relating effectively with others and includes These things. Listening – You need to pay attention to what others say. Understanding – You need to see things from the other person’s perspective. Expressing yourself – You need to state your ideas and feelings clearly so others understand you. Caring – You need to care about others and you need for others to care about you. You need affection. Friends are a human necessity. One of the things people often do when they are struggling to meet their need for friends is to give in to others. They go along with the gang whether they want to or not. They let themselves be motivated by or controlled by peer pressure. To meet their need for friends, they do things they may not want to do or don’t feel good about doing just so others will like them. By the end of this course, you’ll know how to have good friends without giving in to peer pressure. The fourth level of need is the SELF-ESTEEM need. That is your need to feel good about yourself. It includes these things. Knowing your talents – You can identify what you are really good at and what special skills you have. Everyone has some special skills or talents – things they can do really well. Confidence – You believe in yourself and your ability to handle whatever you are facing. Positive attitude – You look for the positive instead of the negative, finding the good instead of the bad in yourself, in others, and in situations. Significance – You know that what you do makes a difference, that you are important. Vision – You have dreams and things you want to accomplish. 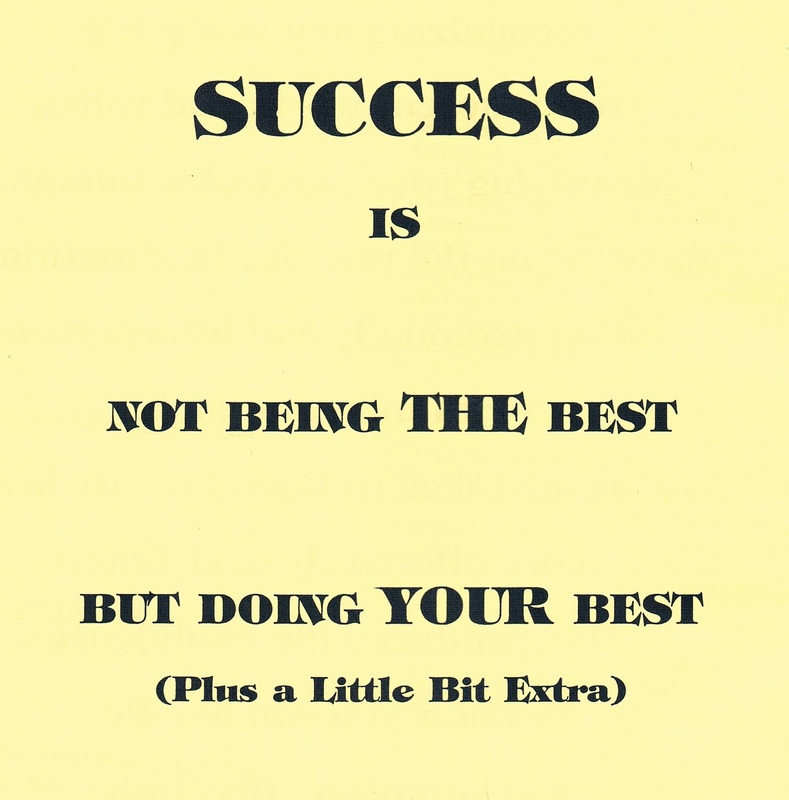 Developing your talents – You work to stretch your special talents so you get better and better. Your lifelong quest is to be better today than yesterday and better tomorrow than today. Concentration – You have the ability to focus your full attention and effort on the task at hand. 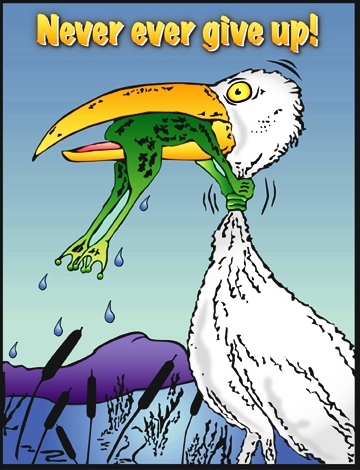 Persistence – You are willing to put in whatever it takes to achieve your objective and not give up. Independence – Self-actualized people understand personal power and how to use it. They don’t wait for a push; they are self-starters. give something back to the world. You use talents and skills to make the world a better place and help others. There is a very high amount of altruism at this level. The happiest and most successful people are those who function mainly on the Self-Actualizing level. Now, let’s look at how these needs effect behavior. The most basic human need is for survival. That’s why physiological needs are at the bottom. Right above that is the need for safety and so on up. You can’t move up, though, until you have met most of your physiological needs. Obviously you can’t work on your safety needs until you have met enough of your physiological needs to stay alive. All human behavior is purposeful. Everything we do is aimed at meeting one of these needs. THE MOST BASIC HUMAN INSTINCT IS TO CHANGE YOUR BEHAVIOR TO MEET THESE NEEDS. Every human being is working to meet the needs on this chart every day ALL DAY. No one ever succeeds entirely. No one ever completely satisfies their needs on even one of these levels. Life is continual growth. People get better and better at meeting their needs, but they never succeed 100 percent. The life situations we find ourselves in are constantly changing. As situations change, the first thing humans do is assess how the change effects their ability to meet their basic needs, then adjust their behavior as best they can to see that each level of need is met as fully as possible. Take a student who is doing well in school, one who has pretty good self-esteem, has good friends, feels secure, and is meeting their physiological needs. Their chart might look like the one on the board. Now let’s say the student’s parents get a divorce. Which level of need does that change threaten?” (I2: safety) “So the student’s functioning on the safety level drops to perhaps about 25 percent.” Enter 25% beside the 70% on the board and do the same with the percentages below as you mention them. The chances are that our student would not be taking the best care of physical needs either. They would probably have trouble sleeping, since they’d be upset about the divorce. So the percentage of meeting their physiological needs would fall, but not as much as safety, maybe to about 40 percent. “Is worry about the divorce going to make it harder for the student to relate to family and friends?” (R: yes) “So that student may withdraw or become moody and less able to meet the need to affiliate. Affiliation might go down to about 20 percent. “Students in that position will hardly feel as positive about themselves as before. They often get a notion that something they did caused the divorce, then self-esteem goes down. The self-esteem of this student might drop to 10 percent. Under these conditions are they able to put forth their best?” (R: no) “Then their self-actualization drops very low, maybe to 5 or 10 percent. This course is about personal power. You CAN do something to control what happens to you in the kind of situation we just described. need to deal with these feelings and get rid of them. You’ll learn how to deal with your own feelings in this class. You’ll learn what to do in situations which interfere with your ability to meet your needs. You’ll be able to pick yourself up and come back. You’ll also be able to do that with less pain and turmoil than you now experience. You will find life easier. 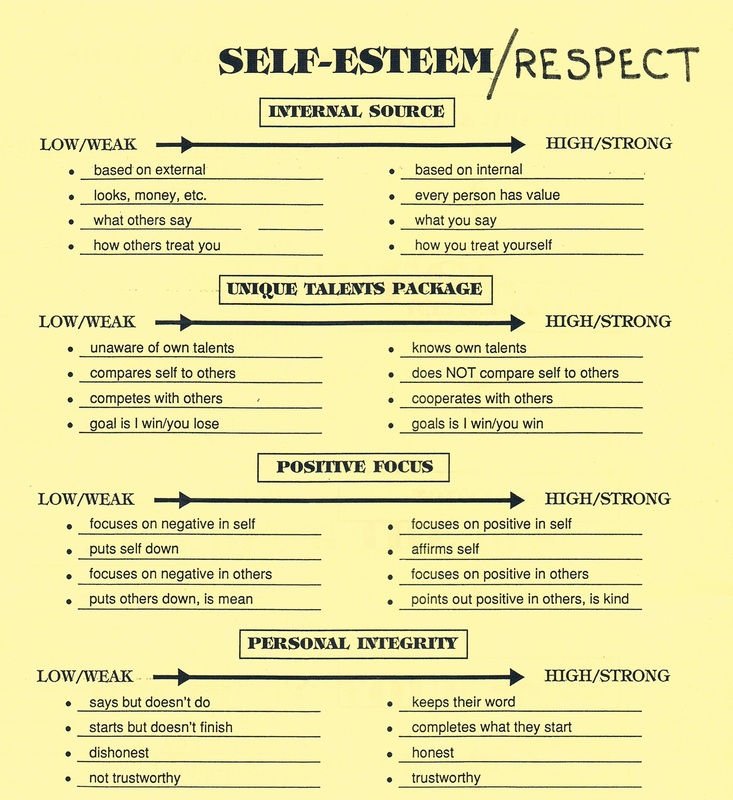 Self-esteem is the most important factor in a person’s success, whatever their endeavor may be. Self-Esteem is NOT liking yourself, it’s RESPECTING yourself and others. Violent criminals “like” themselves, laugh spontaneously, are enthusiastic and proud of their accomplishments. 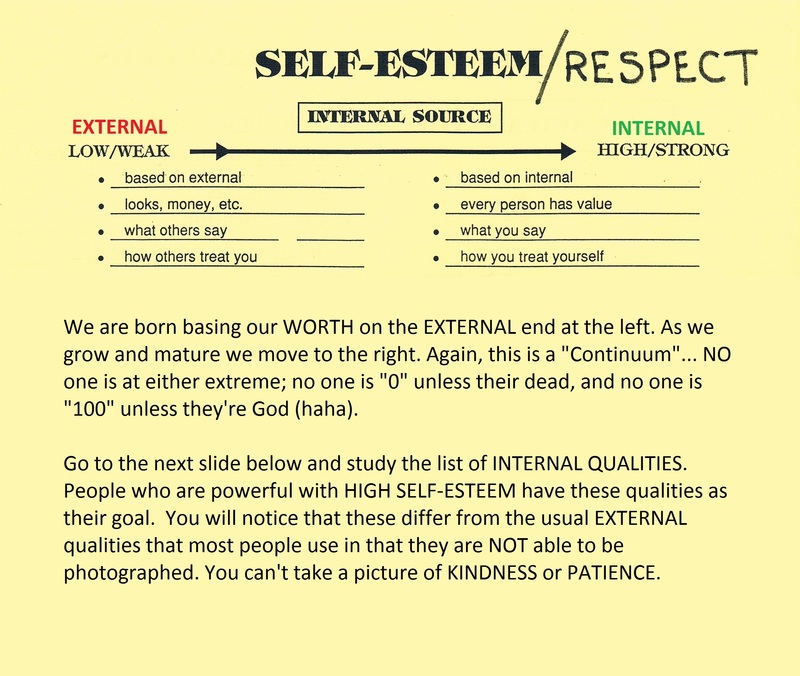 Self-Esteem is more accurately termed Self-Respect. Self-esteem is accepting that you have dignity, worth, and value just because you are a human being. Self-esteem is recognizing your own unique set of talents and skills. 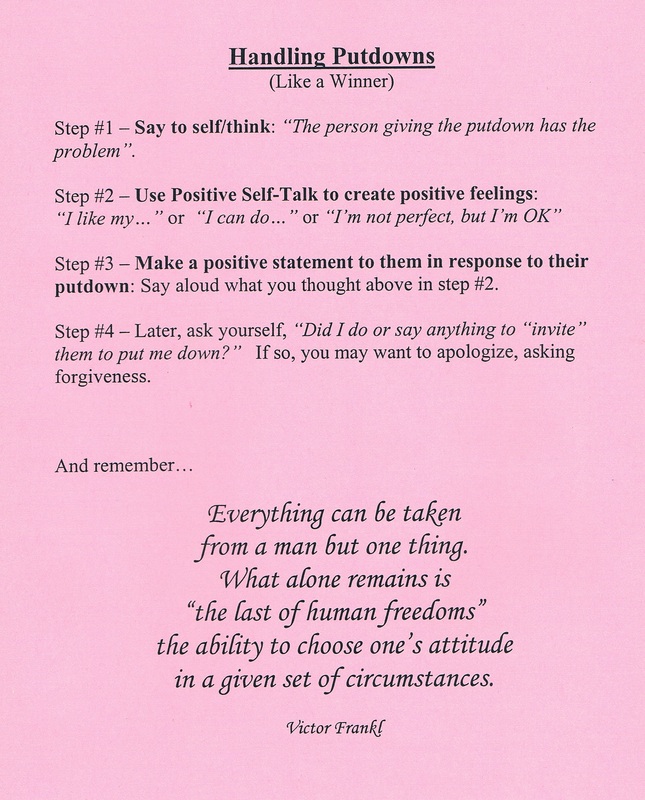 Self-esteem is ‘walking your talk’ – having consistency in thoughts, words, and behaviors. Self-esteem validates being human. It grants permission to make mistakes. Everyone starts life as a new born baby with no self-esteem at all. As an infant and a child, you begin to formulate a sense of your value and worth base on how others treat you. This is externally based self-esteem. This is a natural, normal state for an infant or a child. As you begin to move into the teen years and on into adulthood, you should move toward the Internal end of the continuum as you recognize more and more that you have inherent value just because you are a human being. Sometimes teenagers get stuck on the External and continue into adulthood with external self-esteem. The problem with an externally based self-esteem is that other people and outside factors are IN CONTROL of your self-esteem. That puts you in a powerless position. CONTINUUM is the tool used to measure our growth. Everyone falls somewhere on the line. 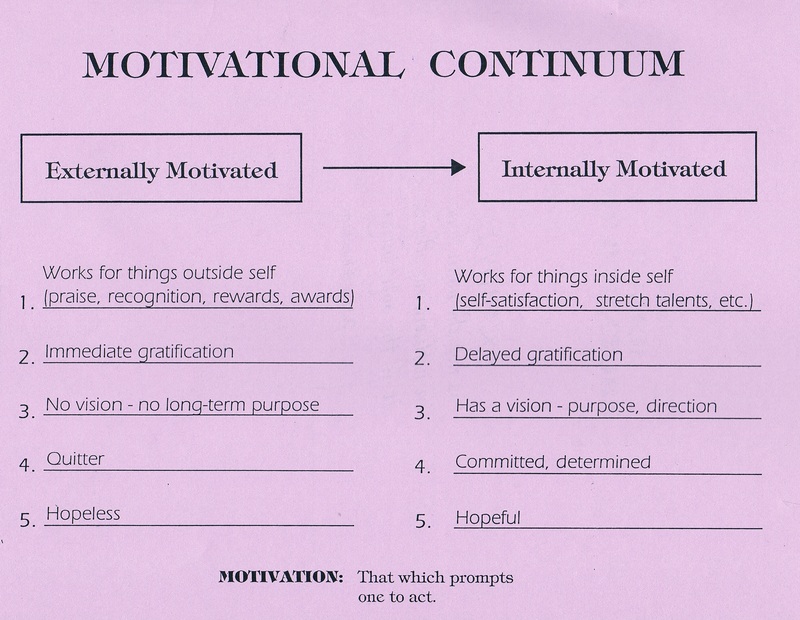 The goal is to move to the RIGHT or more powerful end of the continuum. The ends could also be titled, “EXTERNAL” and “INTERNAL” which in the case of self-esteem represent the source of our worth. 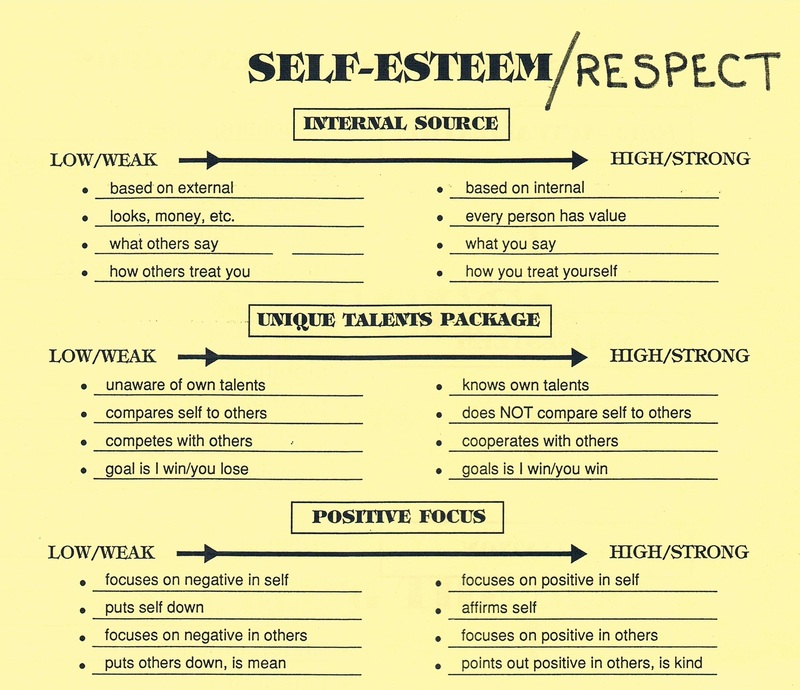 The ability to develop a healthy self-esteem depends on developing the attitudinal skills you need in order to move along the continuum toward the Internal side in each area. Those skills are what this portion of the blog is about. Study the page below for a minute, then we’ll come back to it. Every human being has innate dignity, worth, and value not because of the kind of body they have, or the kind of job they have, or how much money they have, or where they live, or their cultural heritage, or what they have done in the past. Each of us has dignity and worth simply because you are a human being. And that’s enough. Just BEING endows us with dignity, worth, and value. Unfortunately our society puts a lot of importance on external thinks like good looks, physical strength, and money. But those things can’t give a person value and worth. It’s what’s on the inside that matters. It’s interesting to note that when you accept that you have dignity, worth, and value simply because you are a human being, then you must also grant that same dignity, worth, and value to every other human being. They, like you, have it simply because they are human beings. To sharpen our focus and have something specific to shoot for, this list of INTERNAL QUALITIES are what makes a person truly BEAUTIFUL. External qualities naturally decay in time, these qualities can be improved with age. Once you begin to ecognize that your talents and skills are uniquely yours, you will compete less and cooperate more with others. You will begin to compete with yourself, taking pride and finding great pleasure in developing your own talents. Instead of how can I be better than “Isabella” (or whomever), your focus becomes how can I be better today than yesterday and better tomorrow than i was today. 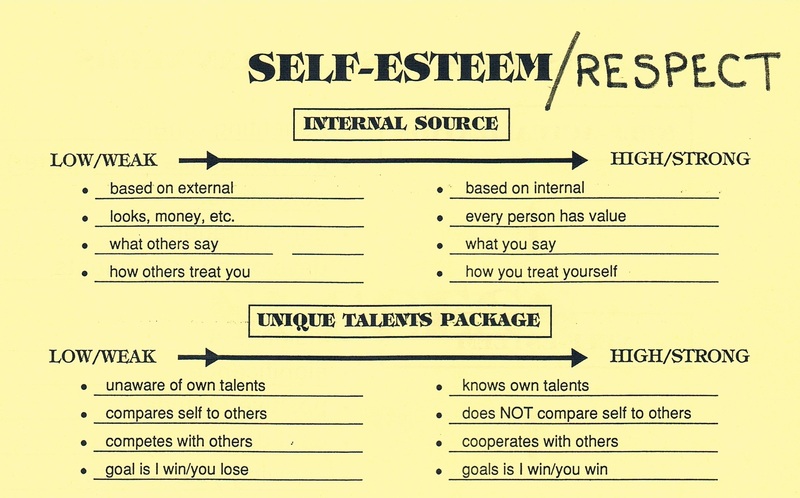 Self-esteem is recognizing our own unique set of talents and skills. Each of us are like snowflakes or leaves on a tree… no two are created alike. Each person is a unique miracle. There never was, there is not now, nor will their ever be another you. You are the only YOU the world will ever get. It’s a waste of time to compare yourself to others — there’s no one else in your league. 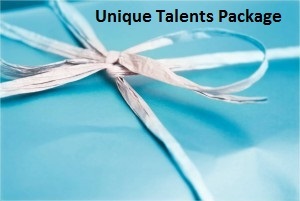 Each person is a package packed full to the brim with abilities, strengths, skills, and talents. There are no empty space in your package. There are no weaknesses in your package; that would be like an empty space in the package. If you don’t have a particular skill, there is nothing wrong with that. It just means that your package is so full of other strengths there wasn’t room for that particular one. Next time you wonder what life is all about, you’ll know the answer: life is for opening your package, discovering what talents you got, and then seeing how far you can stretch those talents you found. Opening your package means getting to know yourself, finding out about the talents in your package, developing those talents, and seeing just how good you can get at those skills. It’s like opening a whole pile of presents and finding out what you can do with them. When you are on the External end of the the Unique Talents continuum, you don’t realize that you are special and unique. You are not aware of what particular talents you have. You think everyone should be able to do everything well. 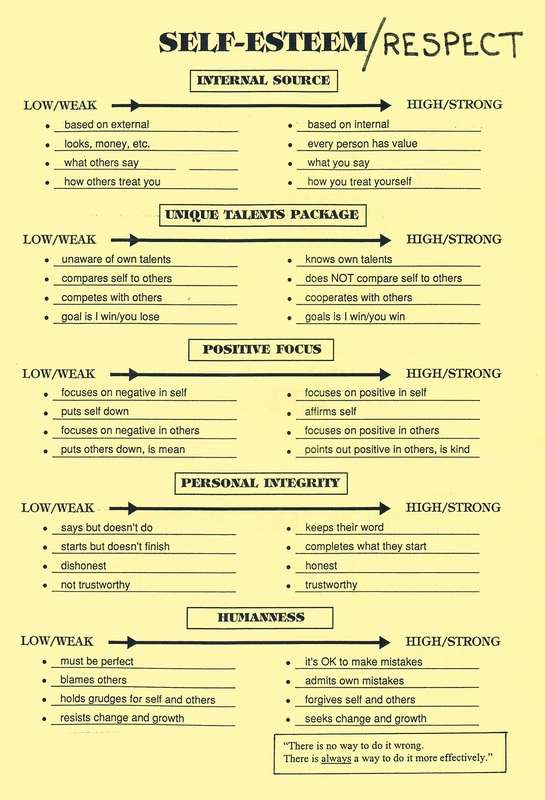 You are always competing against others because you think you have to be the best, or at least better than someone else, to be OK.
Go UP and review the four items on the Internal RIGHT side of the chart. Claiming your self-esteem means learning to focus on the positive in yourself. This helps you recognize your worth and value and promotes self-acceptance. Focusing on the positive, however, doesn’t mean just in yourself. It also means seeing the positive in others, in situations and, in fact, in all aspects of your life. What can you do about this tendency to focus on the negative? You can remind yourself that there are always more positives than negatives. In every single situation, under all conditions, there are always more positives than negatives. 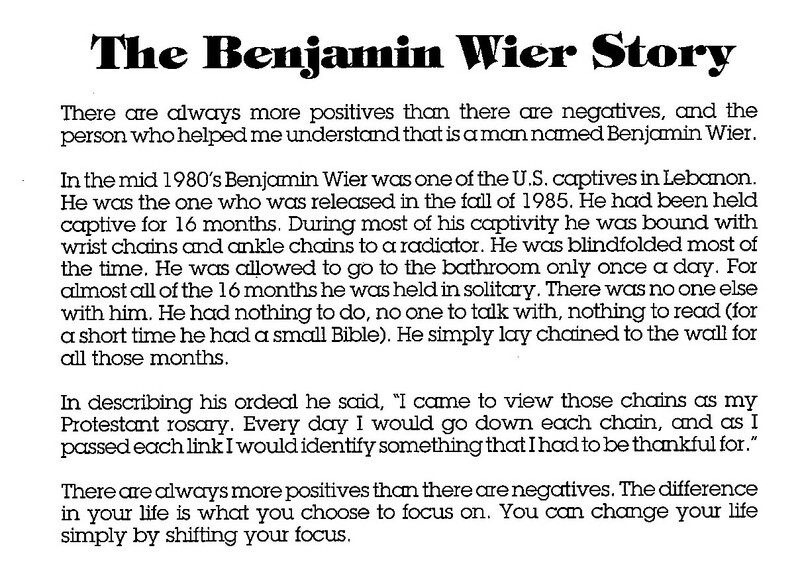 One person who found and used that truth in his own life was a man named Benjamin Wier. In your life the choice is up to you whether you choose to focus on the negative or the positive. The more external your level of self-esteem, the more you focus on the negative. That is because your self-esteem is controlled by factors outside yourself, what others say about you, how others act toward you. That puts you in a powerless position. When you are powerless you feel negative about yourself and so you tend to focus on the negatives — in yourself, in others, and in situations. It is as if you’re looking at the world through negative-colored glasses. the more external your self-esteem, the more controlled you are by others, the more negative you feel, and the thicker your negative glasses are. The more internal your level of self-esteem, the more you focus on the positive. That is because you control your self-esteem by factors inside you, what you say about yourself, and how your treat yourself. That puts you in a powerful position. When you are powerful you feel positive about yourself and so you tend to focus on the positive in yourself, in others, and in situations. It is as if you were looking at the world through positive colored glasses. There always were and always are more positives than negatives in everyone and everything. As your self-esteem because more internal, it just becomes easier for you to SEE them. Without self-esteem’s element of personal integrity the other elements are meaningless, for all the elements are based on honesty to oneself and others. 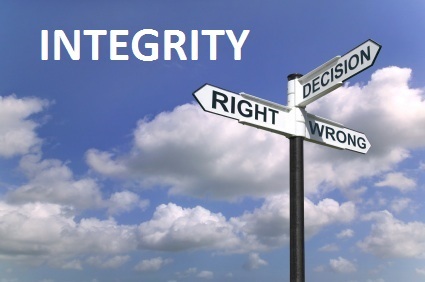 Personal Integrity means honesty, first with yourself and then with others. It also means consistency, making your thoughts, words, and behavior match. The phrase ‘walk the talk’ illustrates the concept of word-behavior consistency. People with strong integrity are the type you can depend on, and thus they gain the confidence of others. Words to describe such people are trustworthy and dependable. Think how this quote applies to the self-esteem area of Personal Integrity (being true to self is being honest, if you are honest with self, then you are also honest with others). 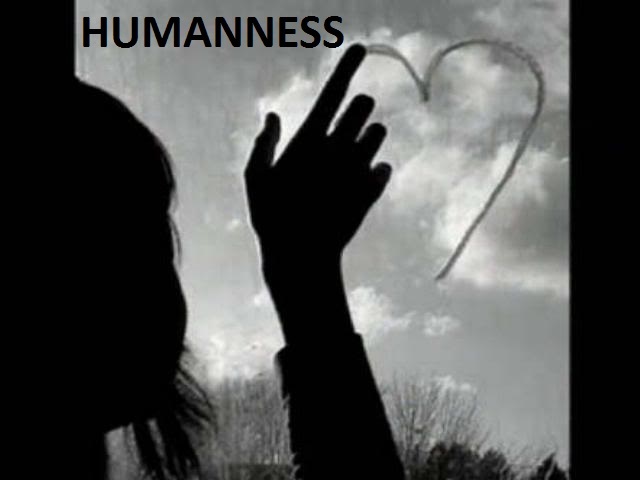 Understanding humanness develops self-acceptance, which in no way implies complacency. Instead, self-acceptance leads to self-confidence. It’s OK to make mistakes. Every human being makes mistakes. NO one is perfect. We can say that nothing has ever been done perfectly, because if we did it over again we could improve upon it in some way. We might do it faster, with less energy, with less waste, etc. So if we can improve it, it wasn’t done perfectly in the first place. People make mistakes every day of their lives. Making mistakes means they are human. There is no way to do it (anything) wrong. There is always a way to do it more effectively. No matter how well you do something, you could always do it better or in a more effective way. A mistake is not wrong; it doesn’t mean you are dumb, stupid, or a failure. A mistake is simply a learning opportunity. Making mistake sis a way to get information that allows you to do it more effectively the next time. Knowing that there is no way to do it wrong and that there is always a way to do it more effectively gives you permission to do something new — to risk. Most people won’t do new things because they are afraid to fail. If it’s OK to make a mistake, you don’t have to be afraid of failing. You can afford to risk. When you have external self-esteem, you don’t recognize your humanness and so you don’t give ourself permission to make mistakes. You think that to be OK you have to do everything perfectly. Since you think you have to be perfect to be OK, you can’t admit your own mistakes and so you blame other people. You have a tendency to hold grudges because you can’t forgive yourself or others for mistakes. You resist change because you are afraid of not being about to do something new perfectly. NOTE: Saying it’s OK to make mistakes doe NOT mean sloppy work is OK> The personal integrity of the person with internal self-esteem demands that they do their best — every time. When they make a mistake, they learn how to do it MORE EFFECTIVELY the next time. Study the four items on the External side of Humanness and then those on the Internal side. This second block of lessons deals with the critical subject of responsibility or, as it’s called in this program, Personal Power. However, it’s hardly possible for you to develop a sense of responsibility until you understand that what you do really does make a difference to others and to yourself. We have it from no less an authority than Albert Einstein that even when one invisible electron changes orbit around an atom, the balance of the entire universe shifts. If you feel your life is controlled by others you are in the powerless position of a helpless victim. This fosters hopelessness, in which case there is no reason to do anything because you THINK it won’t make any difference. Some people find comfort falsely believing that such a person relieves them from responsibility. They find it hard to give up the helpless, hopeless role. Only when we see that responsibility is actually POWER, we we feel the attraction, becoming willing and eager to learn the methods of attaining the control of ourselves and our lives offered in this program. Also, there’s a necessary corollary that personal power does NOT include power over anyone else. Powerful people neither need nor want to control others. Personal Power is the ability to get what we want in ways that maintain dignity and respect for ourselves and others. 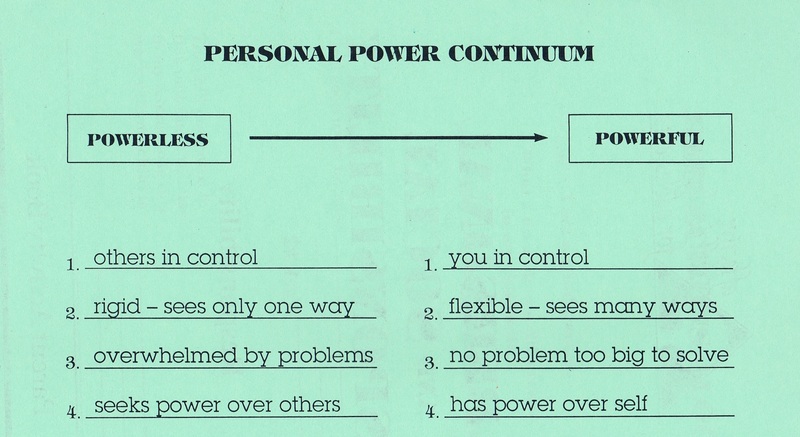 The Personal Power Continuum is like the Self-Esteem Continuum. It goes from POWERLESS through about 4000 steps to POWERFUL. 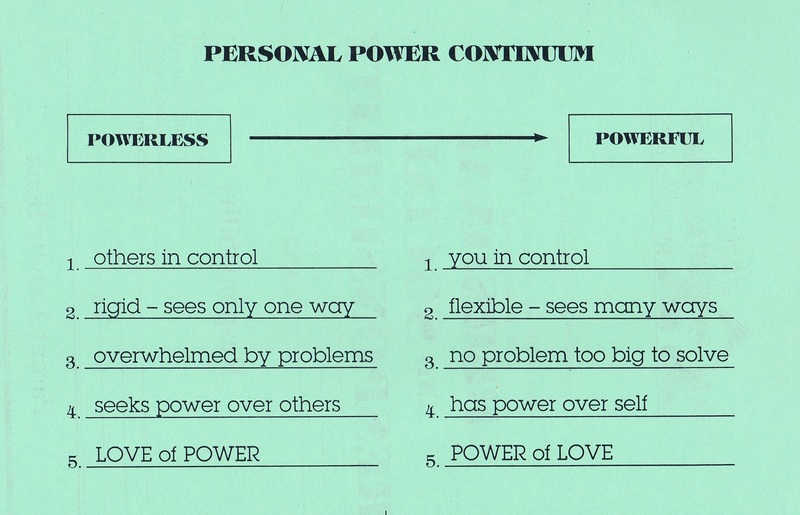 That means personal power is not an either/or issue. You are neither completely POWERLESS nor all POWERFUL. Everyone is functioning somewhere in between and continually moving along the scale hopefully toward the powerful end. What you’ll learn below is how to move closer to the powerful end than you are right now. If you’re powerless, other people cause your feelings. They can MAKE you feel happy or sad, good or bad. If you’re powerful, you control your own feelings no matter what anyone else does or says to you. OUR ABILITY TO PRODUCE THE RESULT WE WANT DEPENDS PARTLY ON HOW MANY DIFFERENT WAYS WE CAN FIGURE OUT TO GO ABOUT GETTING IT. One characteristic of POWERLESS people is that when they want something, they can think of only one way to get it. If that way doesn’t happen to work, they give up because they don’t see any alternatives. They just pile up evidence that they can’t ever make things happen the way they want. They feel more and more powerless, more and more helpless, and finally hopeless. POWERFUL people, on the other hand, know that there are hundreds of possible solutions to every problem. When a problem comes up they review all the possible solutions and pick the one they think has the best probability of succeeding. If that doesn’t work, they go back, review the options again, and pick the one most likely to succeed. They keep doing this until they find one that works. PERSONAL POWER MEANS BEING ABLE TO SUCCESSFULLY RESOLVE WHATEVER PROBLEMS WE ENCOUNTER. Powerless people are overwhelmed by their problems because their problems seldom get resolved. When their one approach fails, they don’t know what else they can do besides fret about it, and the problem just hangs there, maybe growing worse. Powerful people understand that there’s some solution for every problem that comes up. They handle problems by using different ways until they find on that works and get that problem out of their way. THE CORE ISSUE OF PERSONAL POWER IS UNDERSTANDING THAT THE ONLY HEALTHY WAY TO MEET YOUR NEED FOR POWER IS TO BE IN CONTROL OF YOURSELF AND YOUR LIFE. People who are powerless know that others control them. They realize that they don’t control their own thoughts or actions. Being at the mercy of others is not a comfortable feeling. In order to meet your safety level needs you want stability and predictability in your life. Being in control of yourself gives you that in a healthy way. When people can’t control themselves and their lives, they word to satisfy their need for power by controlling others. The problem is that your need for control can never be satisfied by having power and control over others. You can only truly fill this need when you exercise power and control over yourself and your life. Powerless people become bossy and demanding. They put their energy into working on controlling others rather than learning how to control themselves. They develop a (look at line 5 of the Powerless side) LOVE OF POWER. But this love of power can never be satisfied and this person always wants more and more power over others. The only way to satisfy your need for power is to have control over yourself and your life. In addition, exercising power and control over others prevents healthy relationships between people. Powerful people have control over themselves and their lives. They know what they want and they can produce the results they want. They don’t waste time and energy working to control others. They use their energy instead for achieving the goals they set for themselves. As a result, they feel comfortable and secure, thus meeting their safety level needs. Their need for power is fully satisfied in a healthy way. They are then able to recognize the right of others NOT to be controlled. This gives powerful people a solid foundation on which to build relationships in a rewarding way. It opens them to the (look at line 5 of the Powerful side) POWER OF LOVE, Love is the basis of all healthy relationships. We have been talking about self-actualization, learning to be the best we can, developing our talents and skills, and giving something back to the world so it’s a better place. Now we’re going to see the video, Achieve the Impossible: The Bill Irwin Story. Bill is a living example of what a person can accomplish when they are on the powerful end of the Personal Power continuum. In 1990 Bill Irwin hiked the entire 2,169 miles of the Appalachian Trail. He started in the cold rains of March in the mountains of Georgia. For 258 days he and his dog, Orient, hiked through 14 states of the Eastern U.S and he finished in the freezing blizzards of November at the trail’s end in the mountains of Maine. THINK or DISCUSS: what these words mean/; what did Bill do to demonstrate that quality? How could you show that quality in your life? We have been exploring the sources of personal power. Personal power is really the core of this entire program which is designed to help you find out how you can be more effective in getting what you want in life. Next we’ll begin examining the actual steps you can take to claim your own personal power. The starting point is understanding the Behavior Loop. Behavior is what people do and how they do it. It includes what people say and what they think as well as how they act. All human interaction is represented by this diagram. Your side of the loop consists of how you react to what others send you and also what you send to others. 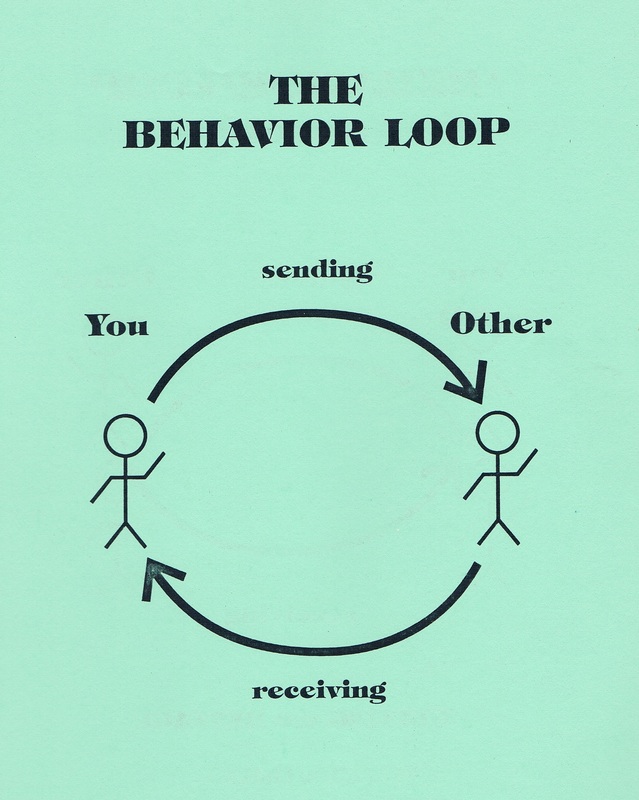 The other’s side of the Loop consists of how they react to what you send and also what they send to you. The type of behaviors that run around this loop determine the quality of your relationships with others. 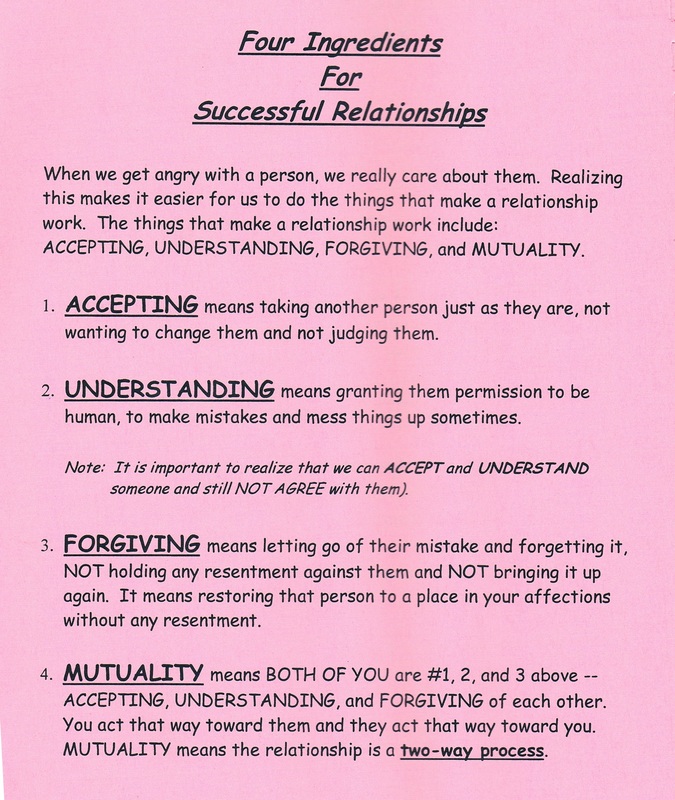 The behaviors that go around the loop in a relationship can be kind, loving, considerate, o understanding. These are productive, healthful relationships. 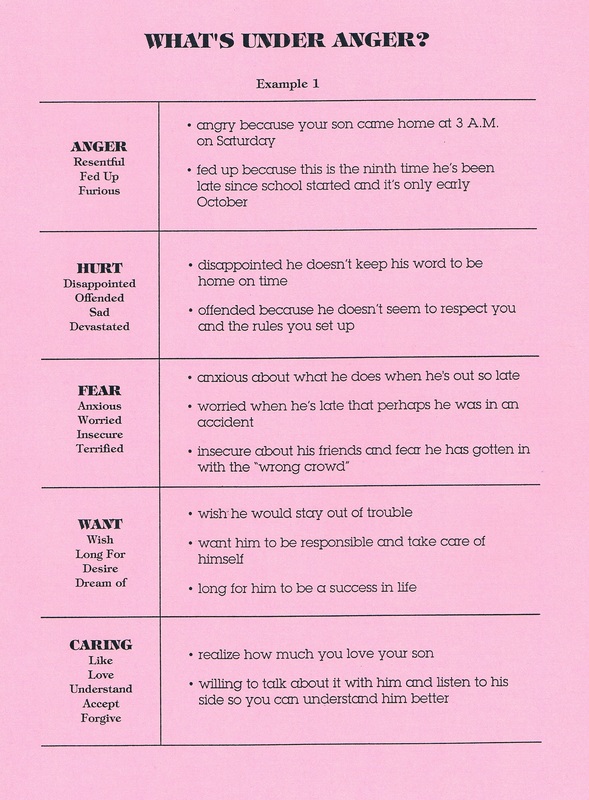 Or the behaviors can be mean, hostile, inconsiderate, put-downs, or just ignoring. These make for unproductive, unhealthy relationships. 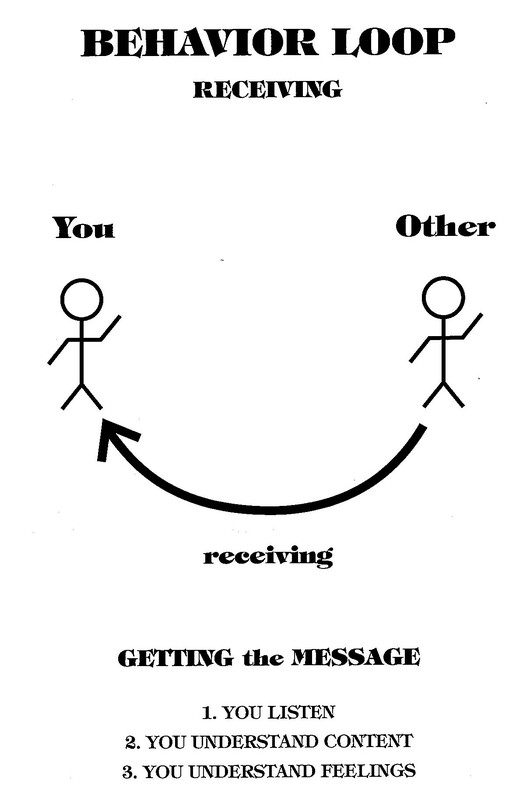 Receiving means getting the message that’s being sent by both listening and observing. a. You attend by paying full attention. b. You understand the content or meaning of the words. c. You sense the feelings behind the content of the words. There will be more about how to develop these specific skills later in the course. 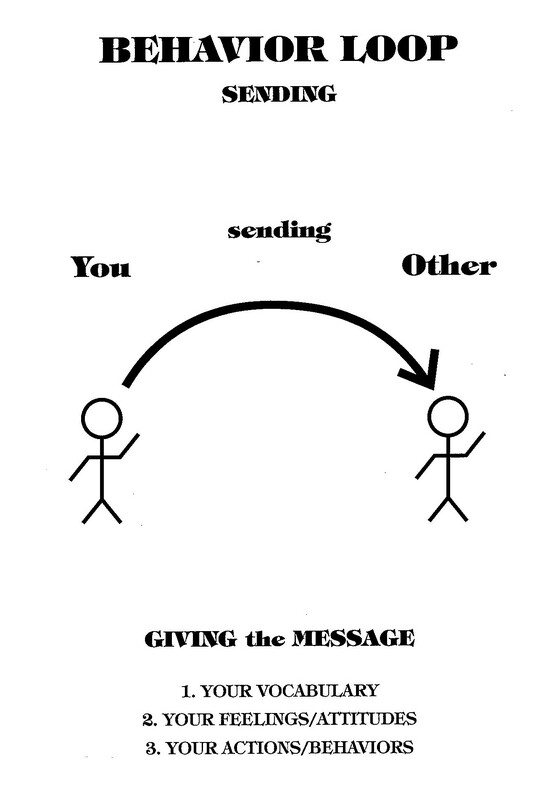 Sending means giving your message to others in various ways to get your point across to them. 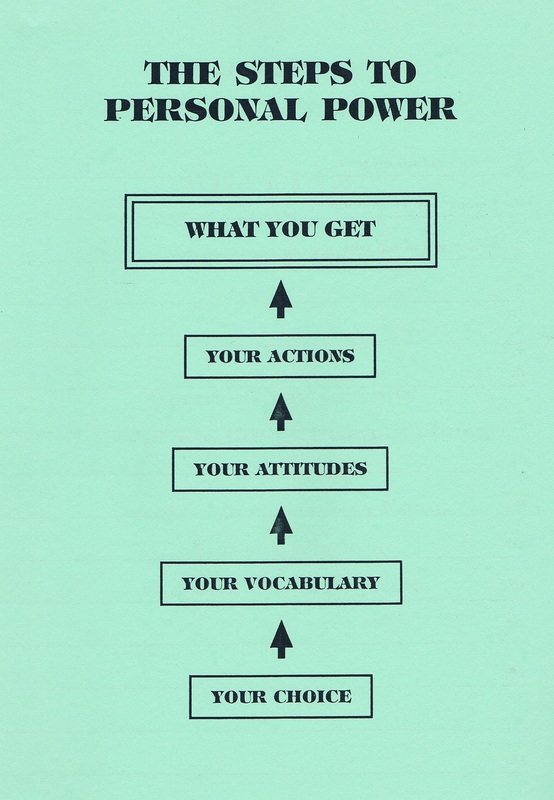 What you send includes, your vocabulary, your feelings/attitudes, and your actions/behaviors. There will be a lot more about these behaviors in upcoming lessons. The only part of the loop within your power to control is YOUR SIDE. There are only three tings you can control on your side of the loop. a. You can attend to and understand what was sent. b. You can react to what was sent. c. You can choose what to send over to the other person. These three things are the only things you can control in life. 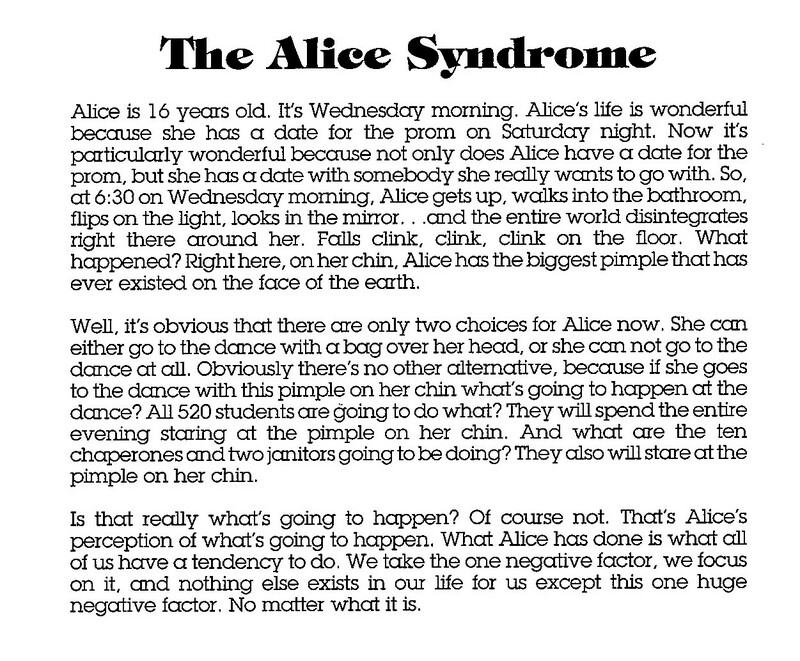 You can not control anything that happens on the other side of the loop. a. You can NOT control whether other people get your message or not. b. You can NOT control how they react to what you send. c. You can NOT control what they send over to you. Behavior sent to you or from you DOES NOT CONTROL. It is only an INVITATION to the one who receives it. It does not MAKE others behave in any particular way. It merely INVITES them to respond. Whether they respond and how they respond are choices only they can make. Failure to make a choice – leaving the choice to fate, luck, other people or events – is also a choice you can make. Choosing not to choose forfeits your personal power. In order to develop personal power, there are four steps to go through. 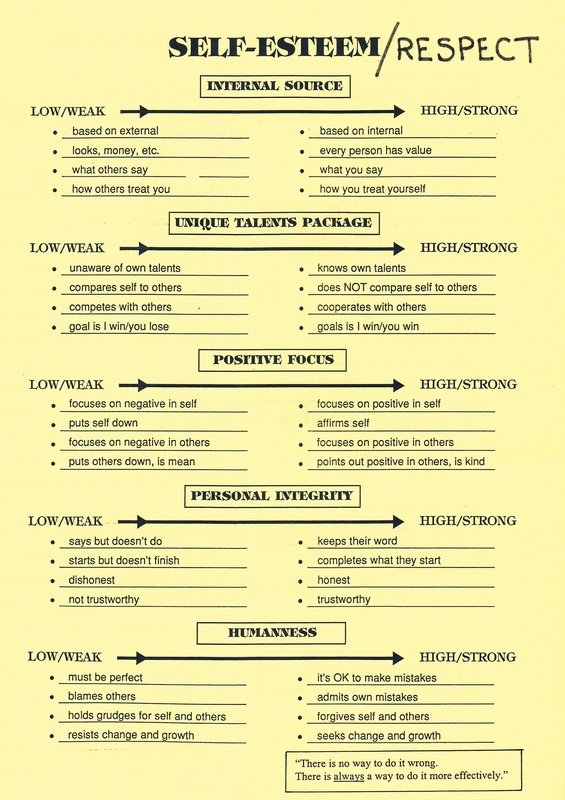 You will start at the bottom of the chart and work upward, since that is how personal power is built. You always have a choice. No matter what the situation in life, you always have the ability to make a choice. The more choices you can identify in any situation, the more personal power you have. One choice you make is the words you say and think. This means means the words and phrases we use. There are two kinds of vocabulary: ORAL, what we say aloud; and SILENT, what we think to ourselves in our heads. 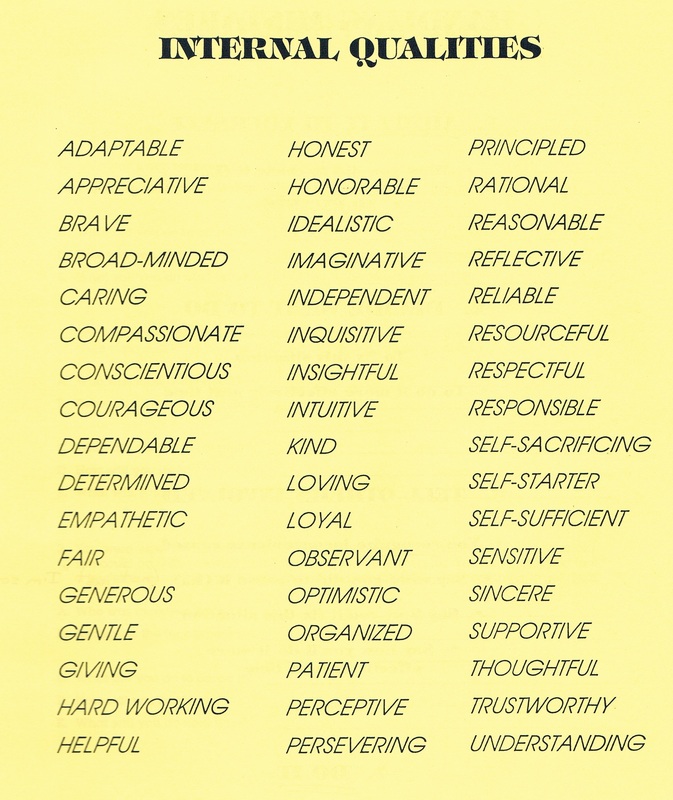 The vocabulary you choose to say and think CREATES your attitudes. These are your feelings, your perceptions, your expectations, the way you view things. Your attitude CREATES your actions. These are the things you do, your behaviors, and how you act. Your actions CREATE what you get in life. Therefore, the place to start building personal power is in choosing your oral and silent vocabulary. By the end of this course, you will be able to choose powerful vocabulary and control your attitudes; you will have the power to produce the actions that will allow you to get what you want in ways that maintain dignity and respect for yourself and others. To change the quality of any relationship, you must introduce a different behavior. Since you can’t control anyone else’s side of the loop, the only place you can introduce a change is on YOUR SIDE. You can change the way you react to what others send you. You can change what you send back to others. If you do one or both of these, you have introduced a new behavior into the loop. 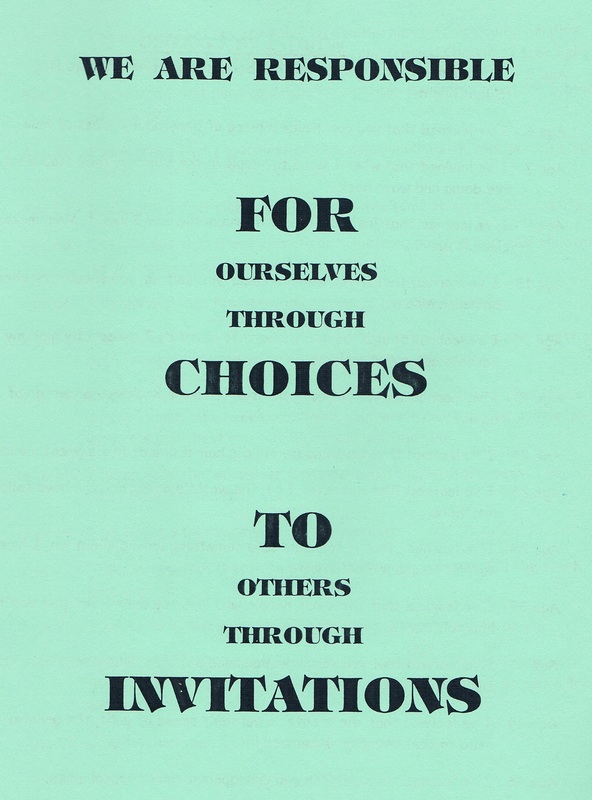 YOU ARE NOW SENDING THE OTHER PERSON A DIFFERENT INVITATION. 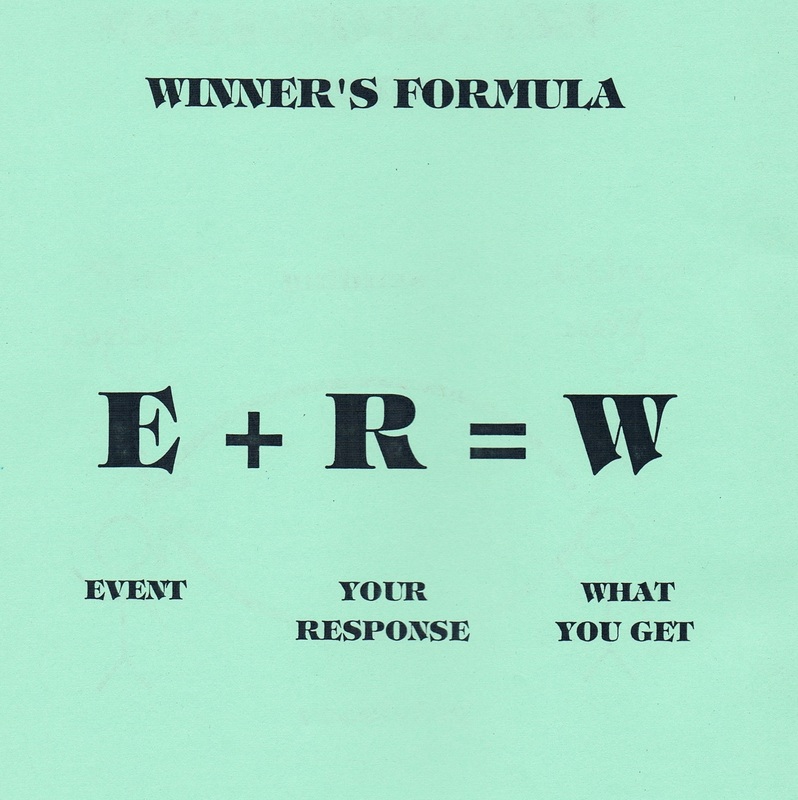 Whether others respond at all and, if so, how they respond, are still their choices. The bottom line is that the only way you can effectively influence others to change their behavior is to give them different invitations by hanging your own behavior. How do you change your own behavior? You make a choice to change and then change your vocabulary. 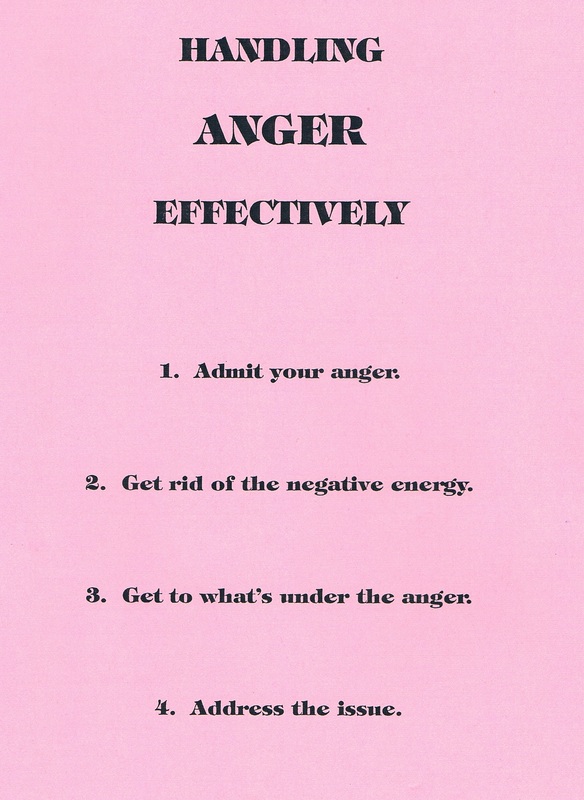 This will shape new attitudes which will change your behavior. Your new behavior will make a change in the quality of behavior running around the loop. Your sided is now different, and your new behavior is giving new kinds of invitations to the other person. So no matter how they respond, you have altered the behavior running around the loop and thus altered the content of the relationship. There is a high probability that when others get different invitations from you, they will see that you are sincere about the different invitations you send. Think of some things that you ‘have to’ do in life? What is the quality of work someone does when they feel that way? (poor, not their best work, do it just to get through it). You have just identified specific things that will happen if you do some particular thing and specific things that will happen if you don’t do that particular thing. If you can say what the result will be if you don’t do it, then do you HAVE to do it? (no). You don’t HAVE to do anything. There is only one thing you have to do and that’s die. There is nothing else you have to do. Do you have to drive within the speed limit? (no). What are the consequences of you don’t (get a ticket, ay a fine). Do you have to clean your room? (no). What are the consequences if you don’t? (get grounded, get scolded). Do you have to eat? (no) What are the consequences if you don’t? (get sick, die. Who decides whether you’ll do something or not? (you do, each person). So you are making choices. A choice has what? (a consequence and a result). So what you’re saying is that when you make a choice to do something or not to do it, you are in reality choosing the consequences that will follow. Think over the things you came up with earlier and think what would you be choosing to happen if you chose not to do it. If you have a choice, who is in control of your life? (each person controls their own). I can’t get a job. I can’t keep my room clean. I can’t save money for a car. I can’t stay out of trouble. I can’t get my homework done all the time. I can’t get along with ____. I can’t get a good grade in History class. List some things you would like to do but can’t; write each one down in a sentence that begins with “I can’t…” If you have a partner they can do it too. Think about things like the examples given that have to do with school, home, friends, or work. Say your “I can’t” statements OUT LOUD while looking at your partner in the eye. Take turns if you have a partner. Think how it feels to say sentences that start with “I can’t. What have you done to the number of choices open to you when you say “I can’t?” (limited them). “How does it feel to say those sentences with ‘I choose not to’ instead of ‘I can’t?”‘ Accept all responses. Once you recognize that you do have a choice and you demonstrate that by saying ‘I choose not to’ rather than ‘I can’t,’ you are then in a position to make a different choice if you want to. 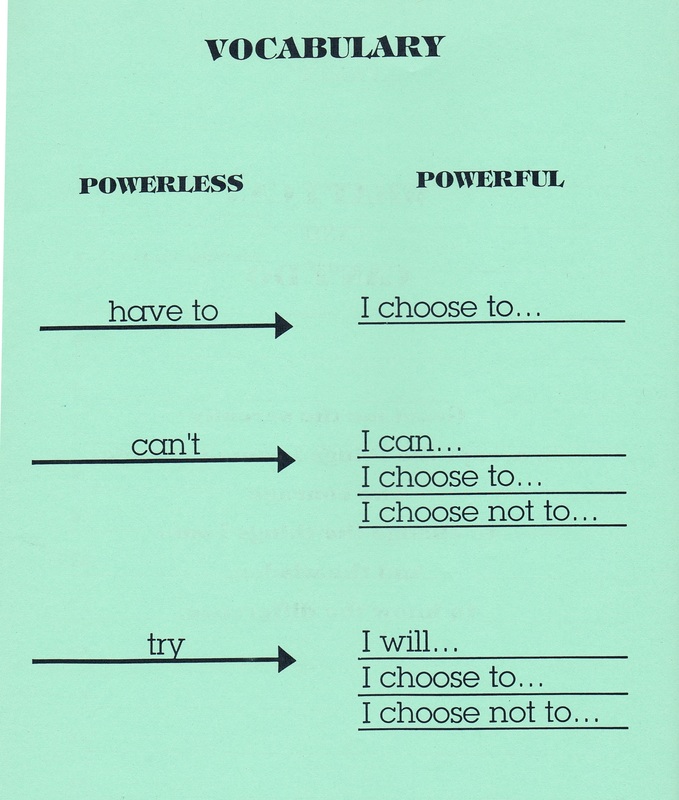 “You don’t have to stay with ‘I choose not to.’ That ability to choose is what all of personal power is based on. “There are some things that are illegal, like driving before 16 or voting before 18, etc. Not doing those is still something you are choosing not to do. You COULD drive a car, you COULD get false documentation, put on make-up to look older, and vote, for example. You ‘choose not to’ do some things because of the consequences that would result. For example “Take running a 4-minute mile. Very few can do it now. But if someone decides they want to do it, they can do it. “How? They would change the priorities in their life, change what they spent their time doing, change what they eat, start a physical training program. It might take spending all their time training, not being with friends, not working, etc. But if running a 4-minute mile were their top priority, they could do it. “For years everyone said it was impossible for a human being to run a mile in less than four minutes but then Roger Bannister did it in under four minutes. Very shortly thereafter several others also broke the four minute barrier. What happened? Suddenly these people changed from thinking `I can’t’ to ‘It’s pos-sible’ AND THEY DID IT! You can achieve anything you want to. “It might be that when you realize what you would have to go through to be able to do it, you’d choose not to do it. The bottom line is that there is always a choice and that choice is yours to make. You can reach any goal you set if you choose to make it your priority in life. “One thing to keep in mind is, contrary to the popular myth, YOU CAN’T HAVE IT ALL. That means that if you have 10 top priorities that you want, you can’t have them all. You will just run yourself ragged chasing them all and probably not get any of them. You can’t change anybody else’s behavior. Individuals themselves we the only ones who are responsible for and can change their behavior. – You can’t make someone like you. – You can’t make your sister be nice to your friends. There are a few instances where you can’t do something for a physical reason, but these are VERY FEW INDEED. Remember Bill Irwin. – A person 5’2″ tall can’t be 6’6. – A person in a wheelchair can’t run a 4-minute mile.One thing to keep in mind when you think about what you can and can’t do is an old saying. 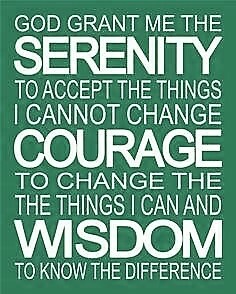 “Grant me the serenity to accept the things I cannot change, The courage to change the things I can, And the wisdom to know the difference. People with personal power do several things to get out of the powerless ‘I can’t’ trap. 2. They realize they always have a choice. 3. They exercise their choice, rank order their priorities, and achieve what they want. Now we’re going to demonstrate some other powerless and powerful vocabulary. The following activity is written as a scrip for a “teacher” to demonstrate to a “student”. Prepare if you’re using this method, or simply visualize if you’re alone now. Place an object that can be picked up in one hand (e.g., a stapler, empty cup, bottle) on a table or the top of a bookshelf where everyone can see it clearly. Instruct your partner to stand near the object and to follow your directions exactly. Say: “Try to pick up the (object name).” Do not give any other instruction, just keep repeating, “Try to pick up the (object name).” Then label whatever action the student takes. Note: There is no way to succeed at the task because there is no way one can “try” to do anything. One either does it or doesn’t do it. When the volunteer is thoroughly frustrated, address the class. Saying ‘try’ is a cop-out. You set yourself up to be powerless because you don’t need to do whatever you said ‘try’ about. ‘TRY’ DOESN’T REQUIRE A RESULT. Our volunteer, for example, could just stand here all day with a hand stretched toward the (object name) and say, ‘I’m trying,’ and thus not accomplish anything. Using ‘try’ sets you up to fail and to be powerless for three reasons. I. “You have a ready excuse for not accomplishing what you set out to do. 2. “Because of the ready excuse, you put less energy and effort into it so you usually don’t succeed. Instead of using ‘try’ there are two things you can do. 1. “You can decide, make a choice, if you are going to do it or not. “Take the examples of being on time for class, doing your home-work, saving money, etc. Now let’s change these from powerless to powerful. “The first thing to decide is whether you’re going to do this thing or not. Are you going to be on time or not? If you decide you are going to be on time, there are two powerful ways to say so. – “I will be on time for class. – “I choose to be on time for class. If you choose not to be on time, first you need to be prepared to accept the consequences of that choice. Then you state your choice in a powerful way. 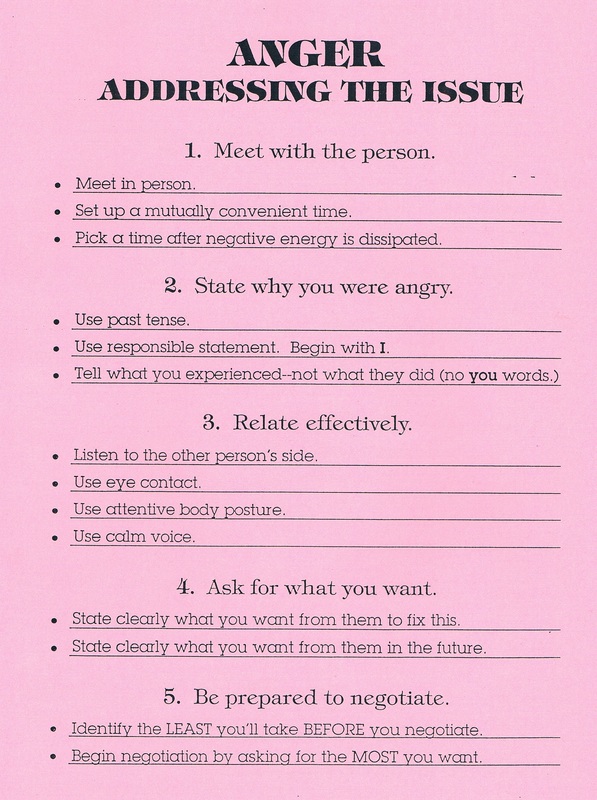 STEP 1 – We’re going to review phrases people use and the effect they have on the person choosing to use them. 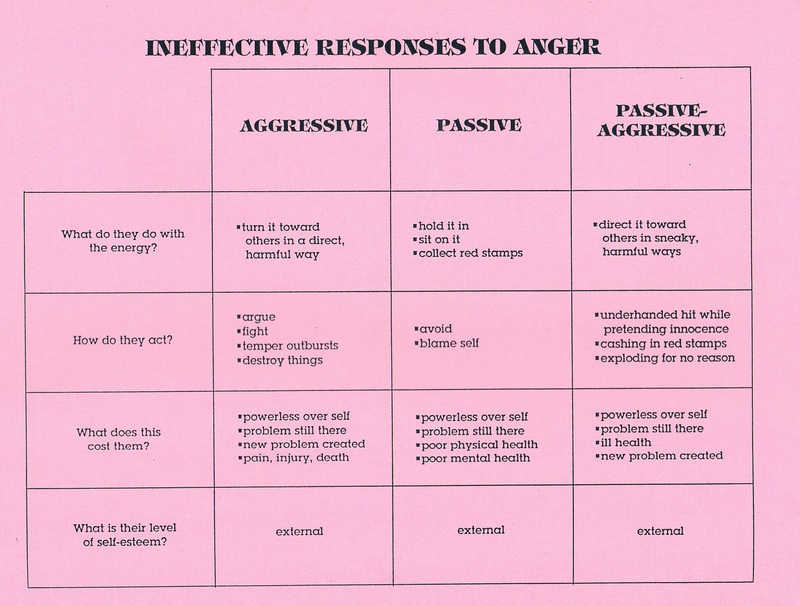 Refer to the Powerless-Powerful Vocabulary chart below. Note: As you review each example and identify the powerful vocabulary. Perhaps go back to the top and start all over… even after 2 dozen years I teaching this class I still never learned it all. Such a great resource you have here Larry. Thank you.